Since the launch of the Temptu Air device in 2015 things have been moving very fast at Temptu, the leading brand in silicone based airbrush makeup. So fast in fact that not only the die hard fans like ourselves, but even the brand's own official website seems at times to have trouble keeping up. I have purchased my Temptu Air kit shortly after our meeting with the lovely Jackie Fan over a year ago which resulted in the great video tutorial reposted below, but I have waited quite a while for this review in order to factor in my own experience, rather than just talk about my first impression. So let's look at all the elements and optional accessories that make up a Temptu Air Kit. The Temptu Air device: as I originally stated in my first impression report, I was immediately struck but how sturdy, powerful and quiet this device really is. The body of the Temptu Air fits very well in the palm of your hand and its weight is ideal. In short, it is a gorgeous little piece of equipment that will win over even those with little or no enthusiasm for technology. As most of you will know, this applicator is designed to work with pre-filled makeup cartridges called Airpods, and also with a top feed, "open cartridge" called Airpod Pro that will allow you to use and custom mix any airbrush makeup formula. Attaching the Airpods to the device is easy, removing them can require a little more strength sometimes, and you must remember to always keep the release button on the device pushed when sliding a cartridge in or out. The power button on the Temtpu Air is also the pressure level selector. There are three pressure settings, marked by attractive and slick led lights right above the button. You must press the button for two seconds to turn the device on or off, and for just one second to select the pressure. This is easy enough to describe, but it may require a little getting used to at the beginning. The amount of color released is regulated by a sliding button called SoftTouch Control, which is quite sensitive and which also will require a little getting used to in order to master subtlety in the application. The Temptu Air recharges with the USB cable and wall adapter enclosed in the box. While charging, the led lights will blink slowly, then stop when the battery is fully charged. It takes around three hours to complete the cycle, and a single charge will last for quite a long time, varying of course according to the usage. To give you an idea, for personal light daily use a single charge could last for over two weeks. When the battery is running out the led indicators starts blinking fast, but the device will keep going for quite a while after that, certainly enough for a full application. The Temptu Air box contains the device, the charge cable and wall adapter, a warranty card and a quick start guide, which is all you really need as it is very easy to use. The Airpod Pro is a top feed "open" cartridge that on the outside looks like any other Airpod, except for a removable lid on the top that covers the well where the colors will be poured. Unlike an Airpod, the inside of the cartridge is quite simple as there is no reservoir, but of course you still have the needle mechanism, that you can move up and down should it get clogged. As for the rest, the Airpod Pro slides in and out of the Temptu Air (or the traditional Airpod airbrush, if you so choose) the same way any Airpod would. Using the Airpod Pro is much like using any airbrush: you pour the desired colors in, mix them if needed, and spray. Temptu advises using a brush to mix the colors, but you can still back bubble if you wish, which I find quicker. Just remember to do it with the lowest settings or the liquid will spurt out, as the well is not very deep. A small, synthetic brush that does not shed will be very useful to clean the cartridge after use, because flushing it out won't be enough and as you cannot remove the needle like you would in a normal airbrush, you will need those bristles to get into small spaces and clean thoroughly. That said, this is the only cleaning you will need to do, as disassembly is not necessary or even possible here. Because of the reduced slant of the well, you will need quite a few drops for the makeup to reach down and start flowing (Temptu usefully advises enough liquid to cover the needle as a gauge for quantity), and while applying you will have to remember to keep the system pointing at a downward angle to use up all the makeup that may stop flowing otherwise. This is a slight drawback, because you won't be able to add just a couple of drops at a time, and you will have to use more makeup than you would with a traditional airbrush. The Airpod Pro has a nozzle wide enough to spray pretty much any kind of airbrush makeup formula, whether it is made by Temptu or not. This means water based makeup as well. Of course the larger nozzle implies a wider spray, and you will have to get used to this and to the smaller range of movement of the SoftTouch button before you achieve results comparable to your traditional airbrush. As far as longevity, Temptu estimates about 120 uses for each Airpod. I am well into my first Airpod's suggested life span and it still works very well, but of course I clean it well after each use. Double Zip Makeup Bag: As soon as you take your Temptu Air out of the box you will realize that you need a bag to carry it around and store it, especially as you will want to protect its lovely shiny finish from scratches and nicks. The Double Zip makeup bag has two compartments. The largest one has three sub compartments with elastic bands that can hold up to four Airpods and several starter kit bottles (7.5 ml) as well as the device resting between them. The slimmer zip compartment is just wide enough for brushes, pencils, lipsticks and complements of similar size. The design is rather stylish and functional, but the bag is made of nylon and polyester with no foam cushioning of any kind, which is a bit of a let down especially considering the steep price of $ 45. Thankfully it is often included in various kit combinations, so you can get it at a much reduced price that way. Airpod Pro Cleaning Pot: This cleaning pot was created especially for the Temptu Air. It is made of durable plastic and comes with a replacement filter (further filters can be purchased through Temptu or at airbrush suppliers, as they are standard size). I love its look and the fact that it's so light to carry around, however there is a major design flaw: the lid has a round opening, while the airpods have a slightly angular shape. This means that when you try to discharge the Airpod Pro you get a very annoying stream of liquid leaking out, defying the whole purpose of a flawlessly clean process. With a price of $25, the only thing that keeps me from calling this a major fail on Temptu's behalf is the fact that it works perfectly with traditional airbrushes, and it has since replaced my heavier glass cleaning pot, but it is not very good at all for its intended original purpose. Hydralock / Perfect Canvas Foundation: the release of the Temtpu Air System was followed shortly by the launch of the Hydralock foundation, the first new line since the original S/B, Dura and Aqua classics. Hydralock was originally launched in 18 colours divided in Light, Medium and Dark groups. Since then, another five intermediate light/medium shades have been added, and the whole line has been made available in Airpod form under the name Perfect Canvas, to offer an alternative to the classic Silk Sphere Airpod line. So, to clarify, the Airpod Perfect Canvas is simply the Hydralock line poured into Airpod cartridges, and has the same exact colours. The formula is silicone based, with "peptides to improve skin’s integrity, a purifying botanical blend and the powerful antioxidant, Goji Berry". The application feels very light, and its consistency is comparable to water based formulas, allowing for a very natural, practically undetectable result. In terms of natural appearance, it is probably the silicone based product with the closest finish to the finest water based formulas, and that is no small feat. The claim that Hydralock is "four times more hydrating than hyaluronic acid" seems perhaps a bit outlandish, but I can confirm that it feels very comfortable. Of course the silicone base makes it water proof, and it does last unaltered for a very long time. Compared to the classic SB formula, Hydralock has a more matte finish, is less moveable and more sheer, but can be layered easily to achieve whatever level of coverage is needed. Preference of one over another Temptu line is ultimately a matter of personal taste top quality being the common denominator. My only hope is that the classic S/B and original Silk Sphere lines will NEVER be discontinued, because are absolute classics, and their amazing finish is unique. The Hydralock / Perfect Canvas line continues to expand and evolve as we write. 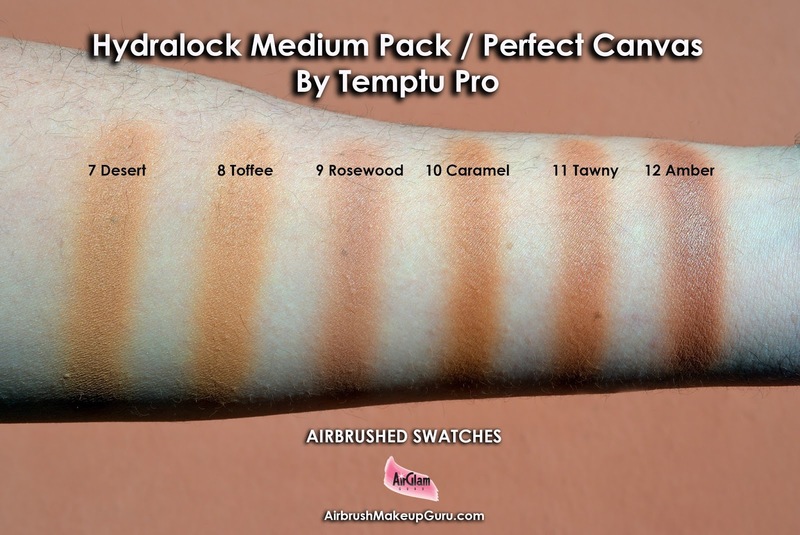 Perfect Canvas Highlighters and Illuminators (called Airglow) have been released with the same names and shades of the original SilkSphere Airpod line, which they seem to have replaced. A set of Hydralock eyeshadows is being launched this week end at the MakeupShow in New York, and will be available on the website in the next few months. Pro Tip /Big Question: Can the Temptu Air actually replace your traditional airbrush system? This depends on your level of reliance on your kit. If you use an airbrush only for base, blush and contour, perhaps it could. If you are an airbrush integralist like myself, you would miss the finesse and control that only a classic hand held airbrush can achieve. That said, the Temtpu Air offers unbeatable practical advantages, especially in those situations where you have to do multiple makeups in a very short time, which make it a must-have, even if just as a valuable addition to your trusted aribrush kit. Pro Tip: Where to buy. 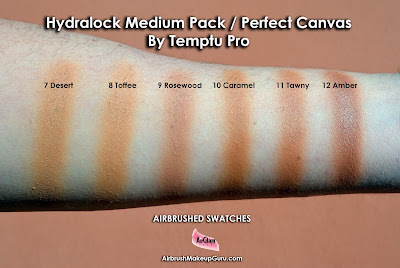 Beside the Temptu website, you can find Temptu Air and many products from the Hydralock and Airpod lines on the Camera Ready Cosmetics site. CRC ship worldwide at the best rates, have fabulous customer service and several pro discount programs. Great post! I saw your video on YT and you told me to read this. Molto efficace ed efficiente..complimenti per il post avete spiegato tutto nei minimi dettagli!! great video tutiorial and Amazing make up. Great job!